Discover our range of Men's leather sandals, handmade in the workshop of La Botte Gardiane located between Nimes and Montpellier. Postage included to Metropolitan France. 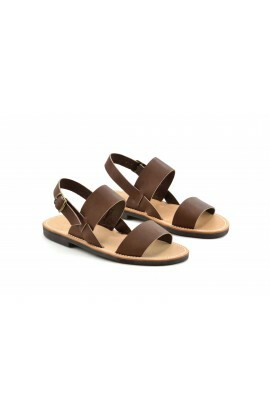 Castel, mule leather sandal, with Airlite rubber sole (walking comfort)Shipping costs included to metropolitan France. Flip flop in leather, very comfortable for man. Made in Aigues-Vives, in our manufacture. Apt is a Taizé sandals variation. The difference with Taizé model is the front & instep straps. They are finer & there are 4 straps. The ankle strap begin from the little toe. Sandal leather man very comfortable, entirely made in our workshop. French leather of exceptional quality - Colour natural patina that time. Géronimo : closed heel & semi-open front sandals. Estérel, mules in fat full leather of calf. Option : non slip-pads (on leather sole) Shipping included to mainland France. Timeless design, a classic of our collection with a sober and elegant style. The color of the flanges is fully customizable. Contact us. Options: beige slip pads (heel and sole of leather). Other colors on request. Shipping included to mainland France.